A magnificent whooping crane, an endangered species, glided into my life for a few glorious minutes in the Horicon Marsh, and I’ll never forget him. My husband and I saw him from a distance resting in the marsh. “That’s not an egret,” Harold said. And before I knew it, this impressive bird – the largest in North America – landed right in front of us, no more than 100 yards away. Three sandhill cranes congregated in the area. When a fourth sandhill flew near the whopper, he started dancing and bugling, showing off his astounding black-tipped wings and proud moves. After his impressive show, the coveted female sandhill flew away, leaving behind the disappointed whooping crane, who also flew off moments later. I’m hoping he has better luck next time – with a receptive female whopping crane. I appreciate his dilemma. Finding a mate has got to be tough, even for a handsome male with a thunderous bugle. The typical whooping crane is about five feet high, compared to 42 inches for the sandhill crane. The International Crane Foundation reports that whooping cranes are the rarest cranes in the world. At one time, there were fewer than 20 in existence. Now there are more than 600 whooping cranes in the wild and captivity. 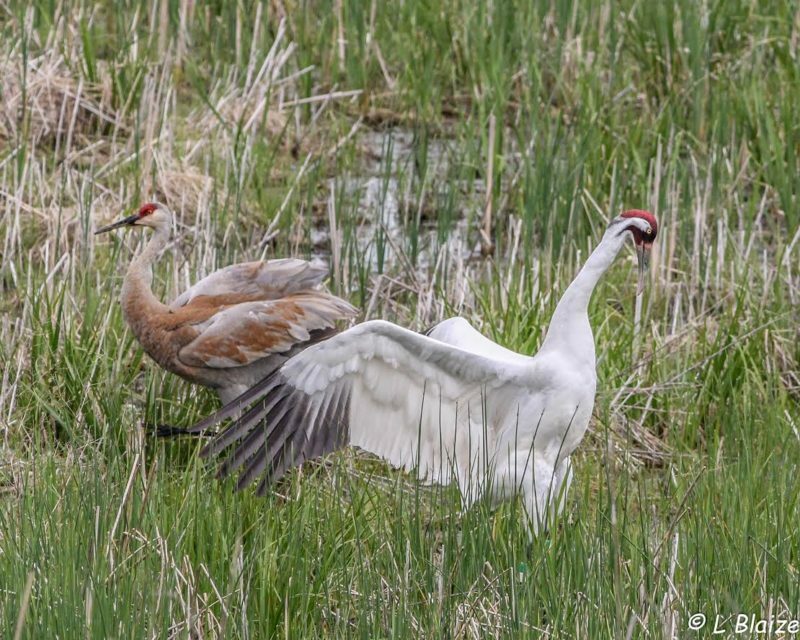 As of May 1, the Whooping Crane Eastern Partnership reported that 86 whopping cranes were confirmed in Wisconsin. My friend the whooper probably was one of those 86. He had lots of colorful bands around his legs. I reported our sighting to the U.S. Fish and Wildlife Service (USFWS), which will probably be able to identify the individual with our band information. Multiple governmental agencies, non-profit organizations and volunteers are working tirelessly to protect these birds. According to the USFWS, the purpose of the reintroduction of the migratory whooping cranes is to establish a population that breeds in the Upper Midwest and migrates to the southeast for the winter. Although the whooping crane may be the symbol of these efforts, other birds, animals and plants benefit as well from improved habitat. Our sighting occurred on the 20th anniversary of the Horicon Marsh Bird Festival organized by the Horicon Marsh Bird Club. 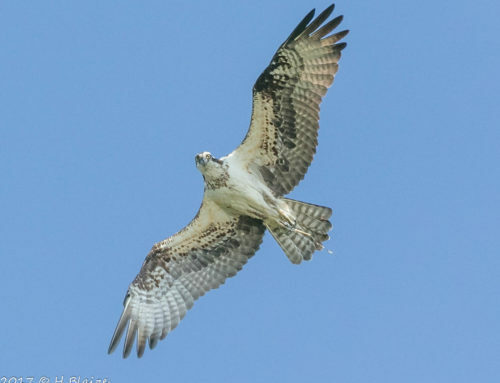 We spotted him in the Horicon National Wildlife Refuge. This event tops the list as the most memorable, but we’ve enjoyed seeing the diverse species that each year brings. Seeing that whooper was a life-changing event. For those few brief moments, I shared an experience with an amazing species that has managed to survive, despite the odds. I salute all who have worked so hard to protect and reintroduce these cranes.